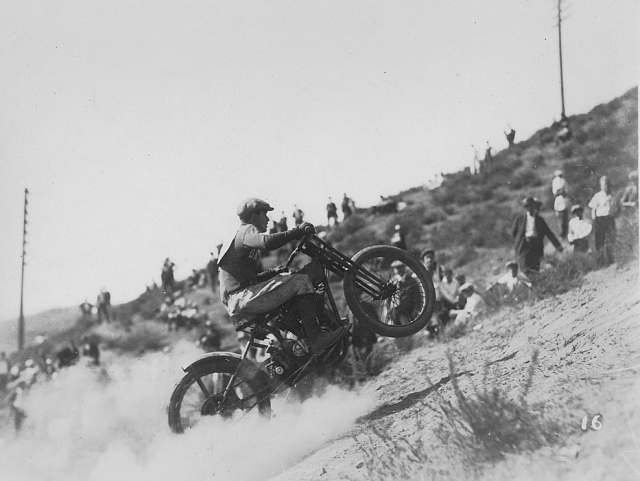 Trailtrekkers have named their trail Motorcycle Hill Trail as a tip of the hat to the daredevil racers of a bygone era. 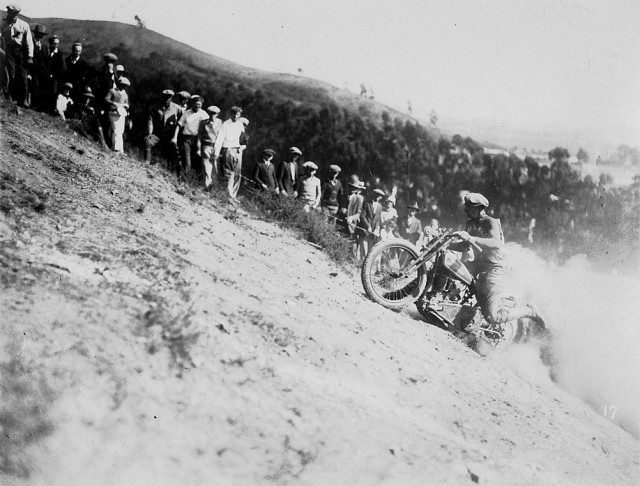 90 years ago, our hillside was the site of the National Motorcycle Hill Climb. On the north side of the Reinecker property, left of present day Potrero Avenue at the end of Blake Street, was the hill climb, and where the Schmidt Dairy stood. 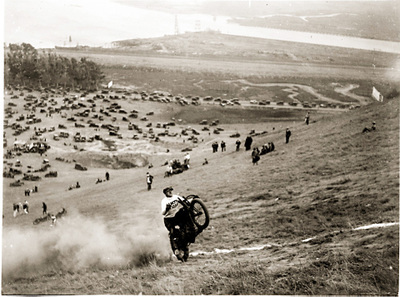 On Sunday, crowds of people would gather to see the motorcycle riders try to get to the top of the hill. This was a very rugged hill and few ever made it to the top. Click for current view from the end Blake Street from Google Earth (note: the pine and eucalyptus trees are new). In later years a fellow who started a garage on San Pablo and Cypress Avenues by the name of Corey, assembled a machine with which he tried to make the climb. The machine was able to travel only a very few feet as it was a very rugged hill. You can see hundreds of cars in the background in some of these shots. Going up this hill climb the motorcycles would bounce like a cork on a strong sea. The steepest part of the hill climb course had an average 74% grade with cuts and ruts one to two feet deep in places. The course was rough and steep. The record time for the 650-foot climb was 27-1/5 seconds from start to going over the top to the finish line. 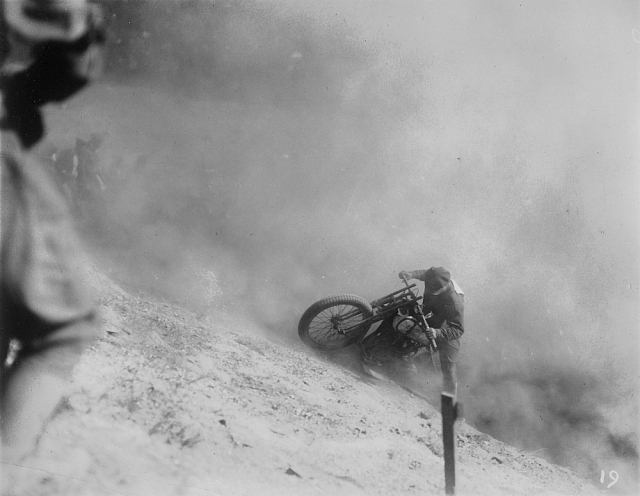 Orrie Steele, of Patterson, New Jersey, who held the eastern championship, attempted to ride and take the championship from Dud Perkins of San Francisco, who held the western championship. 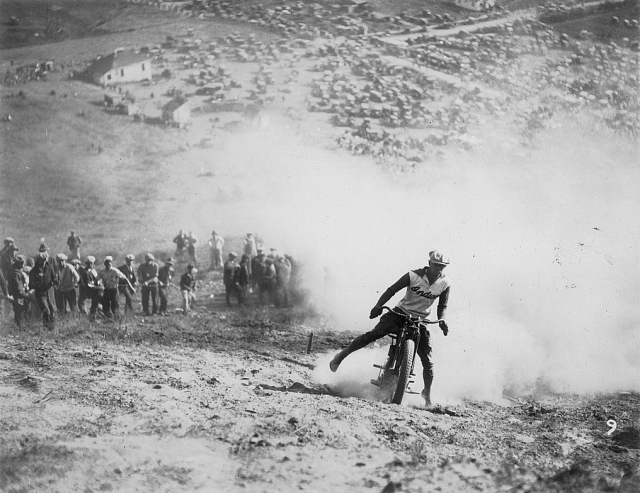 Dud Perkins was known as the Daddy of the Hill Climb and had been competing since 1916. He was always a consistent winner and held the record at the hill. This hill where the Oakland Motorcycle Club held their meets was often referred to as Peralta Hill, but later usually referred to as Thulin Hill. The hill was marked in white lime and the date the hill climb was to be held was in big white letters that could be seen from all along the avenue. Cars would be parked for blocks and blocks around the area as thousands gathered to watch the fun and competition. At that time, most of the streets were not paved and were very dusty. The California contingent of motorcycle racers would go back East and really smoke the Eastern riders. This went on for decades (1925-1960). It’s a long and somewhat involved story with more than its share of intrigue. Some of the key players from 1910 to 1975 were Ray Elam, Dudley Perkins, and Bob Chaves. The above picture was taken at the National Championship hill climb at El Cerrito. You can see San Pablo Bay in the background. Along about 1906, looking up at the hill area from anywhere along the avenue, one could hardly see any trees along the ridge at the top of the hills. Eucalyptus trees along about this time were planted all across the ridge and one of the workers was Louis Nickelson who drove teams horses that plowed the furrows so that when they planted the trees they would all be in a fairly straight line. Small trees were planted every so many feet. It is believed that most of the trees were planted so the owners of the property could call it timberland and get a grant reduction on taxes for property they owned at that time. 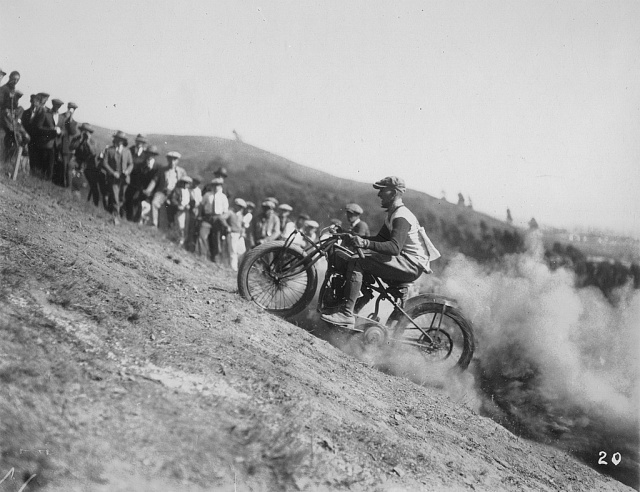 Oakland Motorcycle Club hill-climb event, Sep 28, 1924 on Peralta Hill– Digging in with tire chains. 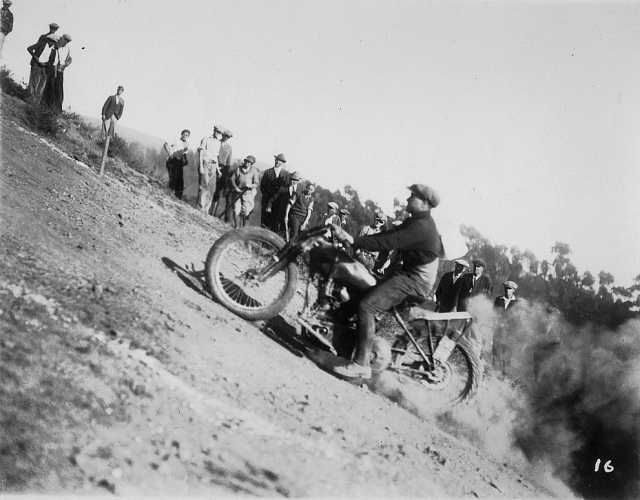 Oakland Motorcycle Club hill-climb, circa 1924. Day 1- Annual Hillside Festival 2019 May 3, 2019 at 5:00 pm – 7:00 pm Location One, Motorcycle Hill trailhead Dave Weinstein leads this often steep hike throughout the hillside. Co-sponsored by the El Cerrito Historical Society. Peeks at Creeks May 18, 2019 at 10:00 am – 12:00 pm Meet on Eureka Ave. between Albemarle St. and Clayton Ave. https://goo.gl/maps/XZpuiKdgEQJEXkUc8 Many creeks in El Cerrito are covered, but in its residential neighborhoods you can find glimpses of exposed portions. Walk leaders Barbara Lass and Wade Huntley will will take us along three creeks and share how they have used local maps to follow buried creek beds and hunt for the signs of the creeks themselves.